In an exciting development, Ganseys.com has gone multimedia. Or at least dipped its toe in the water and found it – well, perhaps a bit chilly, but bracing. This is very much a trial, I should emphasise – there’s no sound for starters (as it was recorded while the washing machine was on its spin cycle). But we thought we’d share it with you, and take suggestions on what we might incorporate in future, what you’d find helpful. The plan is to do it for real on the other sleeve. Before we go any further, I have to stress one important point – the video is just to demonstrate how I pick up stitches, so in it I pick up a whole bunch of them, one after the other. But remember, you knit more rows to the inch (vertically) than you do stitches to the inch (horizontally) – in my case I knit about 12 rows vertically, but only about 9.25 horizontally. That’s a ratio of c.12:9, or 4:3. In other words, if I picked up a stitch for every single row around the armhole I’d end up with far too many stitches, and the sleeve would balloon out like Hamlet’s, if the prince of Denmark ever wore ganseys (under his cloak, probably). Lots of progress this week, and hardly any mistakes. 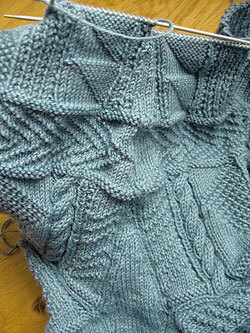 So I’ve finished the gusset (it wasn’t very large in any case) and am well launched on the sleeve. Normally when knitting the sleeve on a gansey which is patterned all over I’d make the top panel (or “sleeve yoke”) some 5-6 inches: long enough to show but not so long it creeps over the elbow, which I try to avoid. In this case, I decided to leave the yoke patterns alone, as I like the proportions as they are. The only downside is they’re too short on their own – but adding another panel would make them too long. Still, with the chevron (which I did resize to a compact, petite 19 stitches excluding the border) the sleeve yoke is just under 5 inches, which is just about long enough. Bread again. As I enjoyed working with fresh yeast so much the other week I decided to have another bash. This time I’ve been using recipes from Richard Bertinet’s “Crust” book, which I’ve tended to avoid in the past because his recipes make quite a lot. But there’s plenty of room in the freezer just now – or there was – so I knocked up a batch of his baguettes made with a poolish ferment (a poolish is just a wet dough that you start the day before and add to the rest of your recipe when you’re ready). 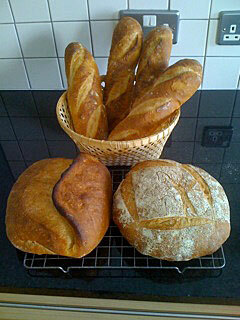 But as it makes so much I used half of it for dough and made the other half into rustic loaves. See I learned something new every day. Your way of picking up stitches is so much more clear. I usually pick up from the right hand. Never thought to pick up from the left hand. I cant wait for the next installment. Pace was very good. Focus was great. Even with your itty bitty stitches, I could see what you were doing very clearly. That was a great video, Gordon – you have no reason to apologise for anything. Winter is extrememly hard on our hands and working with gansey wool just creates more rough skin and ragged cuticles. I pick my stitches up the same direction as you, but I use a crochet hook to grab the wool through the hole and then transfer the loop onto the knitting needle. Same result but another tool involved. What is the total number of stitches are you picking up around this armhole? Suddenly, it all makes sense!! Gordon, you are my new hero! GREAT video! Proves to myself I have been doing this incorrectly for years. Thank you and keep up the good work; good knitting, good videography! Thanks for the feedback, and, of course, the positive comments. The hard part was getting me to keep my hands still as I did it, since it turns out my arms and body move like someone pulling an oar in a slave galley when I knit. So keeping it in shot so Margaret could get it in focus was tricky! Hi, Gail. Now we’ve cracked the technology can home movies be far behind…? Gordon, I never knew about the different proportions in horizontal and vertical knitting. 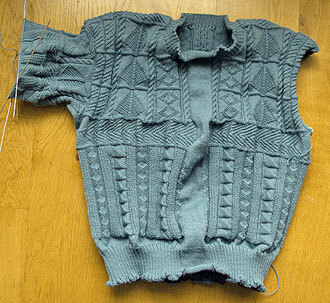 And that explains why the Gansey I knitted for one of my girls did have “ballooning arm holes like Hamlet”. The pattern (it was a Gansey-type sweater knitted flat) did not tell me. So thanks so much. This has given me back some confidence that I didn’t mess up too much. Yes, I had to figure it out for myself by trial and error till the penny dropped – if any of the books I consulted mentioned it, they did it in a way that I, as a knitting tyro, missed completely! So several of my early ganseys definitely had a sort of Renaissance flair to them. I finally reached the point where picking up stitches was no longer a theoretical concept, when I needed to pick up stitches around the neck of my sort-of-a-gansey. I won’t say that the process was completely smooth (my edges are no where near as neat as yours, and so the individual stitches are tricky to pick out) but I didn’t have to worry about the how-to. Thank you again for the video; it was most helpful! I find once you’ve got a few stitches on your needle the next ones become slightly easier to pick out – plus there is usually an easier and a harder side, depending on whether you’re going up or down the armhole – if you look closely you’ll see I cowardly chose the easier side for my demonstration! But I just have to breathe deeply, force myself to relax, and take it slowly. It takes me half an hour to an hour, depending, and like visiting the dentist, once it’s over you feel so much better! And it does get easier with practice.